A top quality fully-built quiet gaming PC, using high performance components. This formidable specification machine doesn't compromise on performance and comes with a two-year fully inclusive warranty. The Serenity Pro Gamer is a great choice for customers looking for elegance and quietness while still being able to provide enough FPS for the most demanding of games. The PC is built around the be quiet Silent Base chassis which offer excellent cooling at very low noise levels. Whether you opt for the larger Silent Base 801 or the smaller Silent Base 601 be assured you are purchasing a high quality gaming system that uses only the very best quiet components. Any air-cooled PC will always be a compromise between quietness (arising from careful cooling design) and performance (which produces heat). This situation affects gamers even more than most because of course, the latest and greatest processors and 3D graphics cards tend to be the ones which run the hottest and which have the loudest fans on them. We've done a lot of development work in this area to bring you the Serenity Pro Gamer - a fully built high performance PC which we think offers the best of both worlds - virtually silent running (especially when the PC isn't being used for gaming), and extraordinary gaming performance with great cooling design which gives total safety and reliability for your precious CPU and GPU. This PC takes advantage of Intel's latest Coffee Lake CPUs. These processors have broken the mold as they now feature more cores and threads compared to previous generations. The Core i3 now features four cores and the i5 and i7 versions are now 6 core CPUs, which is an increase of two cores for each processor. As well as an increase in core count, the amount of threads for each CPU has also gone up, meaning more multi-tasking can be achieved. These additional cores and threads really make the 8th Generation a great performer. For example, the Core i3 8350K CPU is now equivalent in terms of performance to the 7th Gen Core i5 7600K but costs significantly less - giving you more performance for less money. When specifying your new PC's storage options using our system configurator below, you will be offered a choice of drives which vary by price and capacity. There are two primary types of storage. A conventional hard disk drive (HDD) offers huge storage capacity for a low price, but it won't be especially fast and it will generate a certain amount of running noise since it contains a constantly-rotating spindle. A solid state (SSD) or a M2 drive on the other hand, offer tremendous speed and absolutely silent operation, but they cost more than an HDD for any given capacity. Therefore if you need a lot of storage space (for videos or large quantities of digital photos for example), then we would recommend an HDD. On the other hand, if you prefer silence and speed (especially boot-up speed), then an SSD or M2 drive would be a better choice. Of course you can have more than one drive, so you could have the best of both worlds by choosing one of each! We recommend that customers chose an SSD or M2 drive as a boot drive that contains the operating system and important programs and a conventional HDD to store other data. Here at Quiet PC we believe that customers have every right to expect the best possible performance from a brand new PC, so every system we build comes with our Clean Build™ promise. We install the operating system (if you order one), motherboard drivers, OS updates and Microsoft Security Essentials / Windows Defender - that's it. You won't be pestered by pop-ups and nag screens and you can get on with using your new PC immediately without having to uninstall lots of junkware first. Your new machine will boot in super-quick time and will stay running quickly for many months and years to come. We offer free hardware technical support for as long as you own the machine. This support covers any hardware query or problem, including advice on maintenance and upgrades. We regret we can't offer software support or training so we would recommend contacting the software vendor in this instance. be quiet Silent Base 601 Orange Midi PC Case, BG025 ? be quiet Silent Base 601 Windowed Orange Midi PC Case, BGW25 ? be quiet Silent Base 801 Window Orange PC Case, BGW28 ? 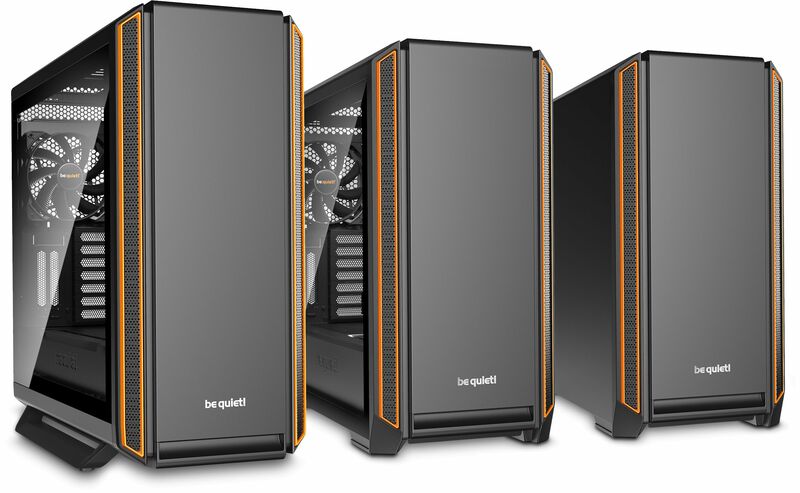 be quiet Dark Base 900 Orange ATX Chassis, BG010 ? be quiet Dark Base Pro 900 Rev.2 Orange with Window ATX Chassis, BGW14 ? ASUS ROG STRIX Z390-F GAMING LGA1151 ATX Motherboard ? 4.0GHz Intel 8th Gen Core i3 8350K 4C/4T 91W 8MB Coffee Lake CPU ? 3.7GHz Intel 8th Gen Core i3 8300 4C/4T 65W 8MB Coffee Lake CPU ? 3.7GHz Intel 9th Gen Core i5 9600K 6C/6T 95W 9MB Coffee Lake Refresh CPU ? 3.1GHz Intel 8th Gen Core i5 8600 6C/6T 65W 9MB Coffee Lake CPU ? 3.6GHz Intel 9th Gen Core i7 9700K 8C/8T 95W 12MB Coffee Lake Refresh CPU ? 3.6GHz Intel 9th Gen Core i9 9900K 8C/16T 95W 16MB Coffee Lake Refresh CPU ? 8GB Corsair DDR4 Vengeance LPX 8GB (2x4GB) Memory Kit ? 16GB Corsair DDR4 Vengeance LPX 16GB (2x8GB) Memory Kit ? 16GB Corsair DDR4 Vengeance PRO RGB 16GB (2x8GB) Memory ? 32GB Corsair DDR4 Vengeance LPX 32GB (2x16GB) Memory Kit ? 32GB Corsair DDR4 Vengeance PRO RGB 32GB (2x16GB) Memory ? 64GB Corsair DDR4 Vengeance LPX 64GB (4x16GB) Memory Kit ? Noctua NH-U12S Ultra-Quiet Slim CPU Cooler with NF-F12 fan ? Noctua NH-U14S Ultra-Quiet Slim CPU Cooler with NF-A15 fan ? be quiet Silent Loop 120mm AIO CPU Water Cooler, BW001 ? be quiet Silent Loop 240mm AIO CPU Water Cooler, BW002 ? Choose an option below and we will use the selected thermal compound wherever it is required. Alternatively leave none selected and we will apply the thermal paste supplied. Arctic Silver AS5 3.5g, High-Density Polysynthetic Silver Thermal Compound ? Noctua NT-H2 Pro-Grade Thermal Paste, 3.5g ? Palit GeForce GTX 1050 Ti StormX 4GB GDDR5 Graphics Card ? ASUS GeForce GTX 1050Ti ROG STRIX 4GB GDDR5 Graphics Card ? Palit GeForce GTX 1660 Ti StormX OC Edition 6GB Graphics Card ? ASUS GeForce GTX 1660 Ti DUAL OC Edition 6GB Graphics Card ? Palit GeForce RTX 2060 6GB GamingPro OC Turing Graphics Card ? Palit GeForce RTX 2070 8GB JetStream Graphics Card ? ASUS GeForce RTX 2080 DUAL OC 8GB GDDR6 VR Ready Graphics Card ? Palit GeForce RTX 2080 Ti DUAL 11GB GDDR6 Graphics Card ? FSP Hyper M 500W Modular Quiet Power Supply ? be quiet Pure Power 10 600W Quiet PSU, BN274 ? FSP Hyper M 600W Modular Quiet Power Supply ? FSP Hyper M 700W Modular Quiet Power Supply ? be quiet Straight Power 11 CM 450W Modular PSU, BN280 ? FSP Hydro G 650W Semi-Fanless Modular PSU, 80+ Gold ? be quiet Straight Power 11 CM 550W Modular PSU, BN281 ? be quiet Straight Power 11 CM 650W Modular PSU, BN282 ? FSP Hydro G 750W Semi-Fanless Modular PSU, 80+ Gold ? be quiet Straight Power 11 CM 750W Modular PSU, BN283 ? be quiet Straight Power 11 CM 850W Modular PSU, BN284 ? be quiet Straight Power 11 CM 1000W Modular PSU, BN285 ? Please note, we are only able to supply UK or Euro mains cords. Quiet PC IEC C13 Euro Mains Power Cord, 2m (Type F) ? Quiet PC IEC C13 UK Mains Power Cord, 1.8m (Type G) ? The figures in brackets show the read and write speeds of the drive. 128GB Samsung PM961 Polaris NVMe M.2 SSD (2800/600) ? 250GB Samsung 970 EVO Plus M.2 NVMe SSD (3500/2300) ? 500GB Samsung 970 EVO Plus M.2 NVMe SSD (3500/3200) ? 512GB Samsung 970 PRO M.2 Phoenix NVMe SSD (3500/2300) ? 1TB Samsung 970 EVO Plus M.2 NVMe SSD (3500/3300) ? 1TB Samsung 970 PRO M.2 Phoenix NVMe SSD (3500/2700) ? Please note; selecting a HDD or SSHD will generate some noise as they contain moving parts. Choose a SSD for total silence. 1TB Seagate BarraCuda 3.5in Hard Disk Drive HDD ? 1TB WD WD10EZRZ Caviar Blue 3.5in Hard Disk Drive ? 1TB Seagate BarraCuda 2.5in 7mm Hard Disk Drive HDD ? 500GB Seagate FireCuda 2.5in Solid State Hybrid Drive SSHD ? 2TB Seagate BarraCuda 3.5in Hard Disk Drive HDD ? 250GB Samsung 860 EVO 2.5in Solid State Drive ? 2TB WD WD20EZRZ Blue 3.5in Hard Disk Drive ? 1TB Seagate FireCuda 2.5in Solid State Hybrid Drive SSHD ? 1TB Seagate FireCuda 3.5in Solid State Hybrid Drive SSHD ? 500GB Samsung 860 EVO 2.5in Solid State Drive ? 4TB Seagate BarraCuda 3.5in Hard Disk Drive HDD ? 3TB WD WD30EZRZ Blue 3.5in Hard Disk Drive ? 256GB Samsung 860 PRO 2.5in Solid State Drive ? 2TB Seagate FireCuda 3.5in Solid State Hybrid Drive SSHD ? 2TB Seagate FireCuda 2.5in Solid State Hybrid Drive SSHD ? 2TB Seagate BarraCuda 2.5in 7mm Hard Disk Drive HDD ? 4TB WD WD40EZRZ Blue 3.5in Hard Disk Drive ? 3TB Seagate BarraCuda 2.5in 15mm Hard Disk Drive HDD ? 1TB Samsung 860 QVO 2.5in SSD Solid State Drive ? 1TB Samsung 860 EVO 2.5in Solid State Drive ? 4TB Seagate BarraCuda 2.5in 15mm Hard Disk Drive HDD ? 512GB Samsung 860 PRO 2.5in Solid State Drive ? 6TB WD WD60EZRZ Blue 3.5in Hard Disk Drive ? 8TB Seagate BarraCuda 3.5in Hard Disk Drive HDD ? 5TB Seagate BarraCuda 2.5in 15mm Hard Disk Drive HDD ? 6TB Seagate BarraCuda Pro 3.5in Hard Disk Drive HDD ? 2TB Samsung 860 EVO 2.5in Solid State Drive ? 1TB Samsung 860 PRO 2.5in Solid State Drive ? 10TB Seagate BarraCuda Pro 3.5in Hard Disk Drive HDD ? 2TB Samsung 860 PRO 2.5in Solid State Drive ? 4TB Samsung 860 EVO 2.5in Solid State Drive ? SupaGeek PCIe to 4x Type A and 1x Type C USB Card ? Microsoft Windows 10 Home 64-bit ? Microsoft Windows 10 Pro 64-bit ? 16GB Backup Pendrive - restores to factory defaults, Win 10 only ? Please note that Windows 10 Pro is required to utilise TPM security. ASUS Trusted Platform Module (Win 10 Pro only) ? Malwarebytes Anti-Malware Premium 1 Year 3 PCs Licence ? Malwarebytes Anti-Malware Premium 1 PC Lifetime Licence ? Microsoft Office 365 (subscription purchased separately) ? Microsoft Office Home & Student 2019 ? Microsoft Office Home & Business 2019 ? Creative Sound Blaster Audigy Fx Low Profile Sound Card ? Creative Sound Blaster Z PCIe High Performance Sound Card ? Creative Sound BlasterX AE-5 RGB PCIe Gaming Soundcard ? Logitech Z130 2.0 Multimedia Speakers ? Logitech Z313 2.1 Speakers System ? ASUS Cerberus Black Wired Headset ? ASUS Cerberus Arctic Wired Headset ? Logitech Z506 5.1 Surround Sound Speakers ? StarTech USB Bluetooth Adapter (Class 1, V2.1 + EDR) ? ASUS USB-BT400 Bluetooth 4.0 Nano Size USB Adapter ? Gigabyte GC-WB1733D-I Dual Band Wireless-AC Wi-Fi/Bluetooth Card ? ASUS PCE-AC56 Dual Band 802.11ac PCIe Wi-Fi Network Adapter ? Logitech K400 Plus Black Wireless Touch Keyboard (UK Layout) ? Microsoft Desktop 600 Wired Keyboard and Mouse (UK layout) ? Logitech MK270 Wireless Keyboard and Optical Mouse (UK Layout) ? Microsoft Desktop 3050 Wireless Keyboard and Mouse (UK layout) ? A4Tech KL-5 Silver/Black Space Saver Compact Keyboard (UK Layout) ? A4Tech KL-5 Black Space Saver Compact Keyboard (UK Layout) ? ASUS GK100 Sagaris Gaming Keyboard (UK Layout) ? ASUS Cerberus Black LED Gaming Keyboard (UK Layout) ? Nanoxia NNR-UK Ncore Retro Keyboard (UK Layout) ? Corsair Gaming K70 LUX RGB MX Silent Mechanical Gaming Keyboard ? Gigabyte M5050 Curvy Optical Mouse ? Logitech B100 Wired Optical USB Mouse ? ASUS Cerberus Arctic Gaming Mouse Mat ? Corsair Gaming Harpoon Optical RGB FPS Gaming Mouse ? Corsair Gaming M65 Pro RGB FPS Gaming Mouse ? Seagate Maxtor M3 Portable 1TB USB3.0 External Hard Drive ? Seagate Backup Plus Hub Desktop Drive 6TB ? Seagate Backup Plus Hub Desktop Drive 8TB ? ASUS VP228HE 21.5in 1920 x 1080 TN 1ms Monitor, HDMI, VGA ? ASUS VP278H 27in 1920 x 1080 TN 1ms Monitor, 2x HDMI, VGA ? ASUS VX24AH Eye Care 23.8in 2560 x 1440 IPS 5ms Monitor, 2x HDMI, VGA ? ASUS PB277Q 27in 2560 x 1440 TN 1ms Monitor, HDMI, DP, DVI-D, VGA ? ASUS VP28UQG 28in 3840 x 2160 TN 1ms Monitor, 2x HDMI, DP ? LG 24UD58 24in 3840 x 2160 IPS 5ms Monitor, 2x HDMI, DP ? ASUS PB287Q 28in 3840 x 2160 TN 1ms Monitor, 2x HDMI, DP ? ASUS XG35VQ ROG Strix 35in 3440 x 1440 VA 1ms Curved Monitor, 2x HDMI, DP ? Kyocera FS-1041 Compact Quiet Mono A4 Laser Printer ? Kyocera FS-1061DN Compact Quiet Mono A4 Duplex Network Laser Printer ? Microsoft LifeCam Cinema 720p HD video USB Webcam ? Microsoft LifeCam Studio 1080p HD video USB Webcam ? Quiet PC Free Silver Warranty (2 years labour and parts) ? Quiet PC Gold Warranty (3 years labour and 2 years parts) ? Quiet PC Platinum Warranty (3 years labour and parts) ? We are dedicated to provide your new PC within 7 working days at no extra charge but if you require a faster service then we have different options below. These services and not 100% guaranteed for customers outside of the UK. 7 Working Days Build Time ? 5 Working Days Build Time ? 3 Working Days Build Time ?